(Nanowerk Spotlight) Photonic crystals are a new kind of material. Also known as photonic band gap material, they are similar to semiconductors, where the electrons are replaced by photons (i.e. light). By creating periodic structures out of materials with contrast in their dielectric constants, it becomes possible to guide the flow of light through the photonic crystals in a way similar to how electrons are directed through doped regions of semiconductors. The photonic band gap (that forbids propagation of a certain frequency range of light) gives rise to distinct optical phenomena and enables one to control light with amazing facility and produce effects that are impossible with conventional optics. Photonic crystals are very suitable for fabricating sensor devices because the optical signals of these responsive materials are tightly coupled with various external stimuli and modulations. They could also play a significant role on the way to all-optical devices in communication and information technology – they form a basis material for the future realization of optical components and circuits, and maybe even complex optical circuits or optical computers. One application area that has seen a lot of activity recently is photonic paper and ink. One advantage of photonic papers and displays is that they are brilliant and free of glare in sunlight, which are superior to the characteristics of other emissive display technologies for outdoor usage such as advertising billboards. Another advantage is that, for recording purposes, the structural colors of photonic paper are usually more durable than traditional pigments and dyes. However, there are still a number of issues and problems that prevent the practical applications of the photonic crystal based materials. Researchers in California have now addressed some of them by reporting a new type of rewritable photonic paper on which a durable ink mark can be written or erased by introducing or removing a hygroscopic salt in the surface layer of the paper. The key point of their work is the use of hygroscopic salt solutions as 'ink' to swell the polymer matrix of photonic crystals and create a very durable contrast of diffraction colors on the photonic paper. The ink marks can be erased by rinsing the paper in water and drying thereafter. The rewritability of the photonic paper and low toxicity of the materials involved make this paper/ink system environmentally friendly, inexpensive, and useful for general applications involve color writing and display. 1) Conventionally, the fabrication for the photonic-crystal based paper typically involves very slow processes, such as colloidal sedimentation or solvent evaporation. It usually takes days or even months to grow photonic crystals with a reasonable size, therefore limiting their practical use. In Yin's work, the photonic paper can be produced instantaneously by assembling magnetic particles into periodic arrays using an external field. The periodic photonic structures can be immediately fixed in a polymer matrix. This allows for future mass production. 2) Conventionally, writing the color information in the photonic paper is achieved by applying a volatile solvent (ink), which swells the polymer matrix, changes the periodicity of the photonic structure, and eventually changes the color of inked region. The color disappears when the solvent evaporates. So the color writing is not permanent. "In our work, the ink is a water-ethanol solution of inorganic hygroscopic salt" says Yin. "This salt solution does not evaporate at room temperature and keeps the polymer matrix in the swelled state so that the color information stays for a long time. Erasing of the written information can be simply achieved by removing the salt solution using additional water." 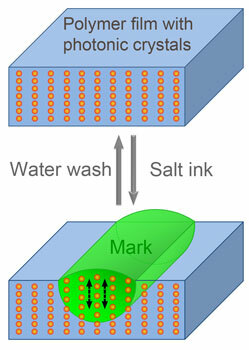 3) Unlike conventional methods which typically involve toxic organic solvent, the salt ink and rinsing water (and the photonic paper itself) are nontoxic and environmentally benign. Yin's team prepared their new type of photonic paper through the fast magnetic field-induced self-assembly of Fe3O4@SiO2 colloids, followed by a simultaneous UV curing process to fix the photonic structures inside the PEGDA matrix. 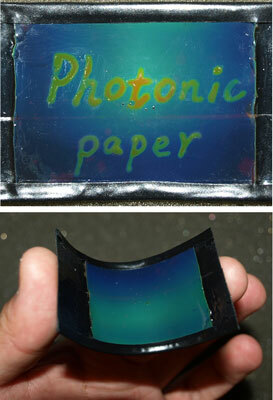 The photonic paper can be fabricated onto a glass substrate or flexible plastic substrate. The findings have been published in a paper in the July 17, 2009 online edition of Advanced Materials (Rewritable Photonic Paper with Hygroscopic Salt Solution as Ink). Yin says that, in principle, the technique developed in his lab can potentially be used to replace conventional paper/ink systems in many areas. Also, compared to existing techniques, his team's rewritable photonic systems have several advantages including the easiness for large-area fabrication, the versatility in pattern generation, and brilliant color in bright sunlight illumination (in contrast to liquid-crystal-type displays). "We believe that more elaborate features, such as multicolor printing, may be realized in the future with the use of multiple inks and modifications to the polymeric matrix of the photonic paper"
There are still some kinks to iron out, though. For instance, the researchers experienced a problem when they write on the photonic paper manually using a small glass capillary 'pen'. As the capillary is not specially designed for writing, the delivery of 'ink' seems to be not very uniform. Yin says that he would expect a better design of a 'pen' or the integration with ink-jet printing process would solve the problem. The immediate future work for Yin's team is to find out the ultimate resolution of this photonic paper, which is an important factor for practical applications. "One interesting question that we will keep working on is the realization of multi-color writing/printing, which might be possible if multiple ink salts are used," says Yin. "We will also explore the integration of this writing mechanism with ink-jet printing techniques in order to achieve a highly controllable delivery of inks."